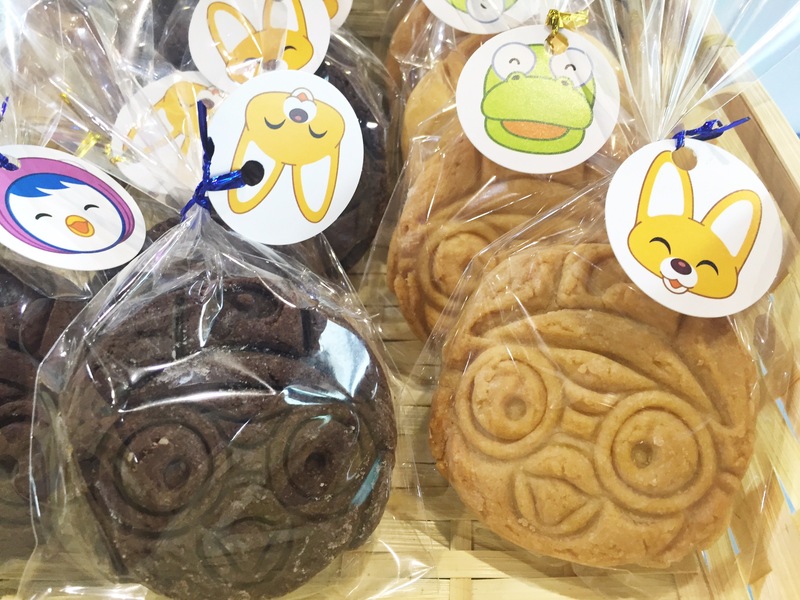 The first thing that may strike one at the entrance of Pororo Park – is how pricey the tickets can be. 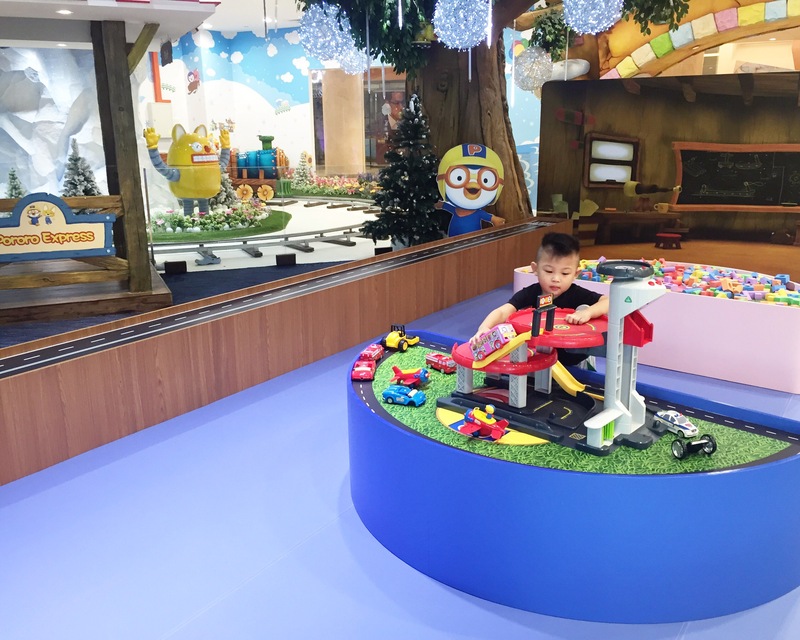 But by the time you’re standing in front of the park, with all its bells and whistles – a real train on a track, a brightly colored play area in the front entrance… It can be challenging to deny your excited toddler access to the park. The question may be whether it’s worthwhile to check it out – here’s our experience. 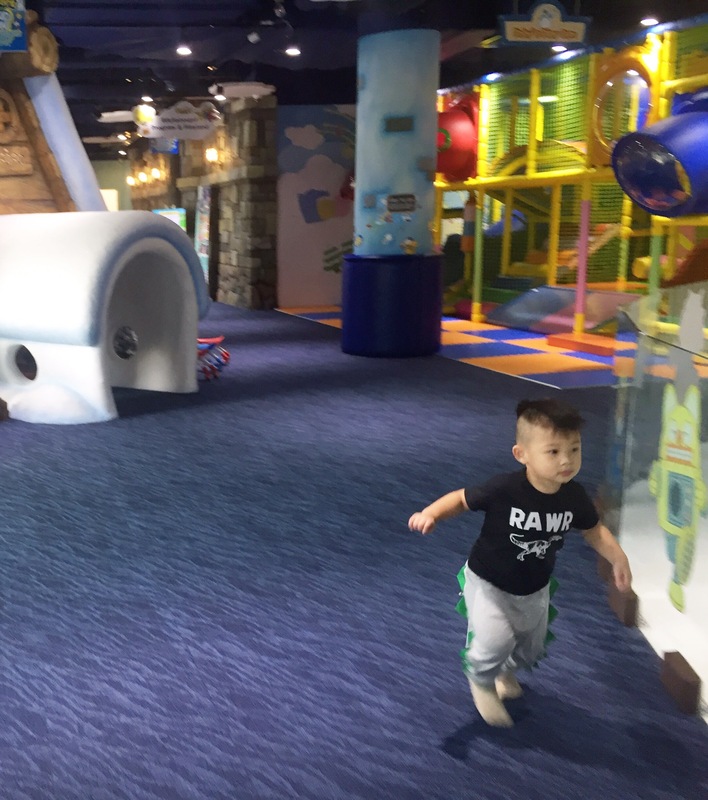 The park features a few activity stations, and can appear smaller than you expect once you’re inside. 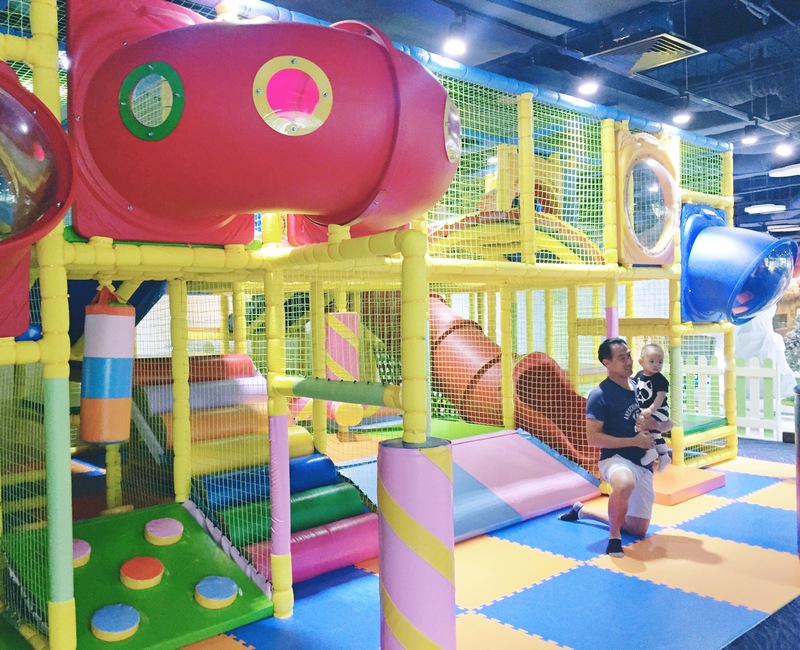 It is however, really good for younger children and toddlers who don’t need big spaces to run and play and there are a lot of activity areas catered to that age group. I would recommend this for kids from 10 months (Jake’s age at time of visit) up to about four years. 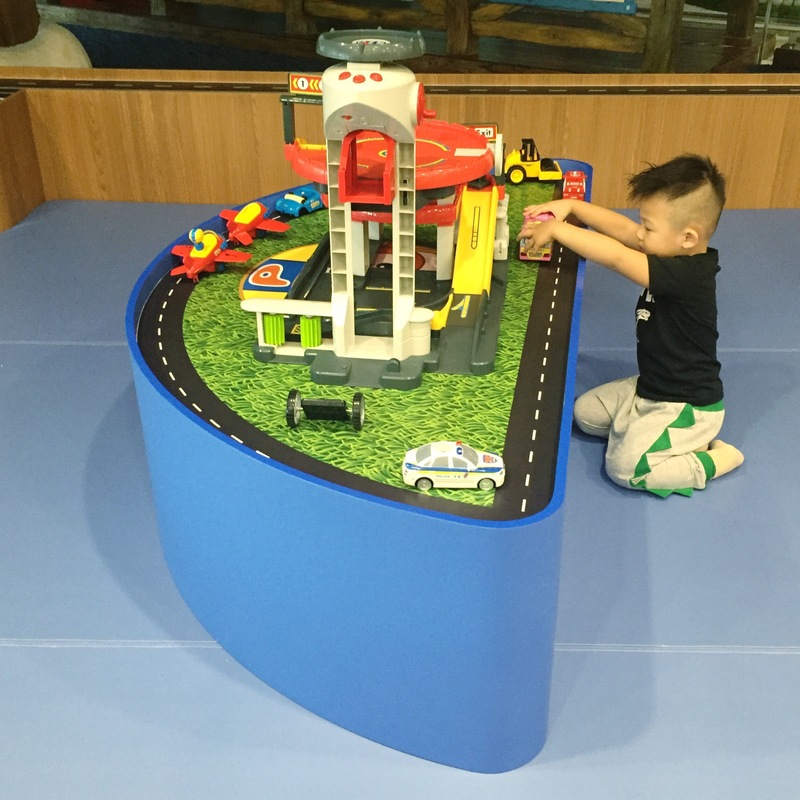 The activity tables in front feature a variety of vehicles and a set of car ramps – nothing exciting in itself, but it captivates Tyler and it takes me ages to pry him away from this table to explore other areas. He has many similar toys at home, including exactly the same toy ramp, but somehow for kids it’s always more fun when it’s not your own toys. 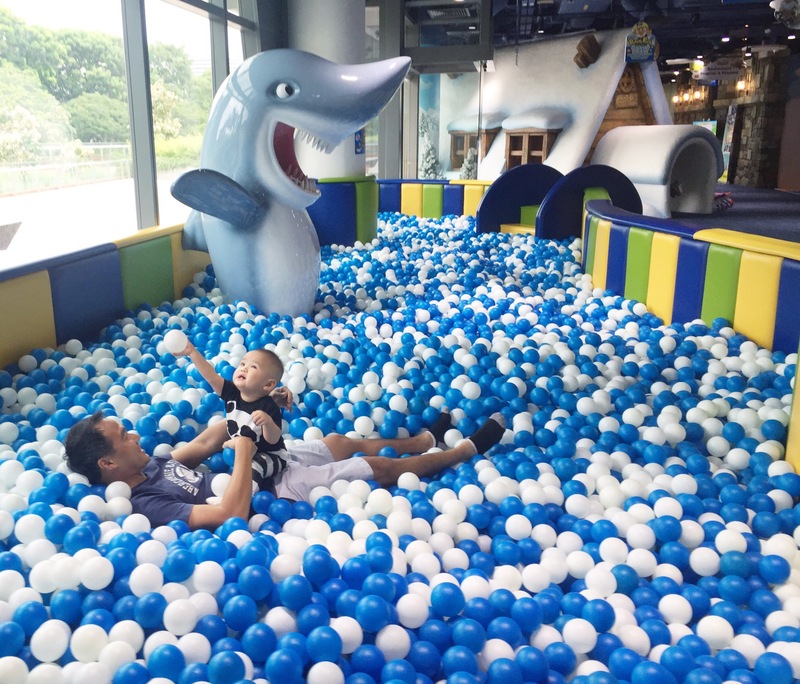 One of the highlights of the indoor park is this lovely blue and white ball pit with a shark feature where you can “feed” balls into its gaping maw. 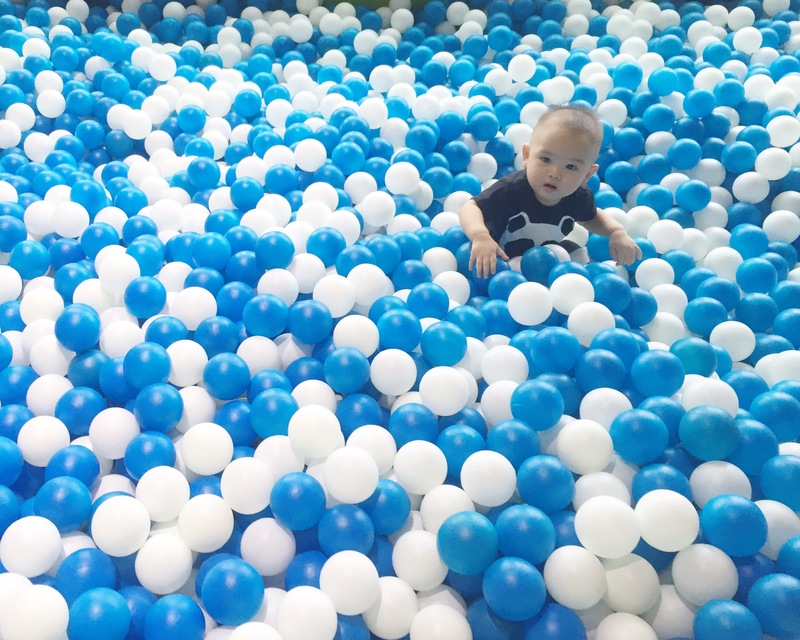 It’s a good sized ball-pit and both boys enjoy having a roll-around in it. 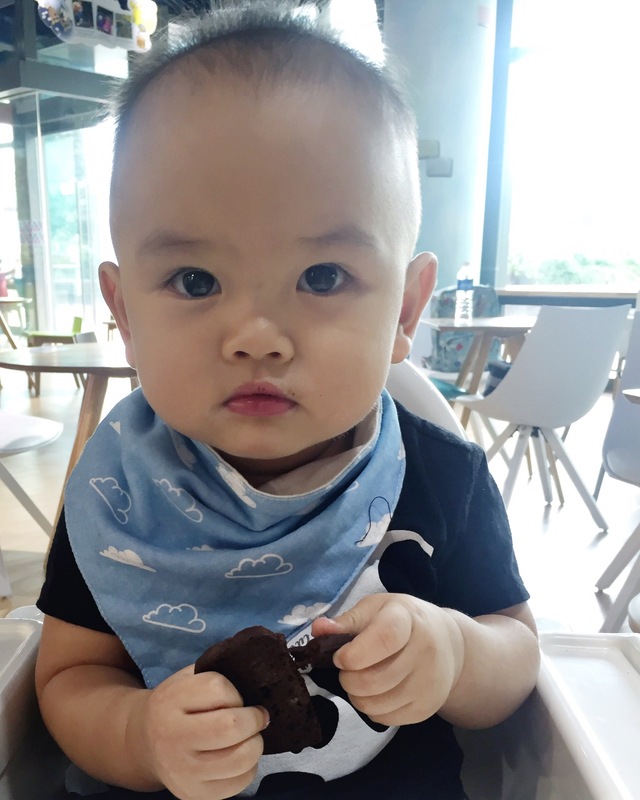 Not to mention it’s right by the window where there’s loads of natural sunlight, so it’s a great place to take happy photos of the little ones! Near the entrace, there is a tiny supermarket corner, which Jake really likes sitting in. 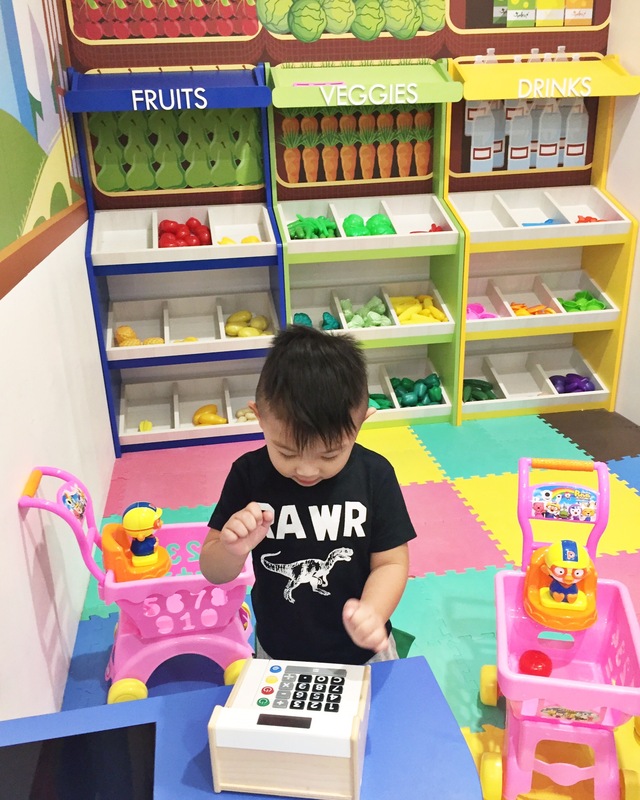 It has a few tiny supermarket carts, with fruit and veggie props and two checkout counters. 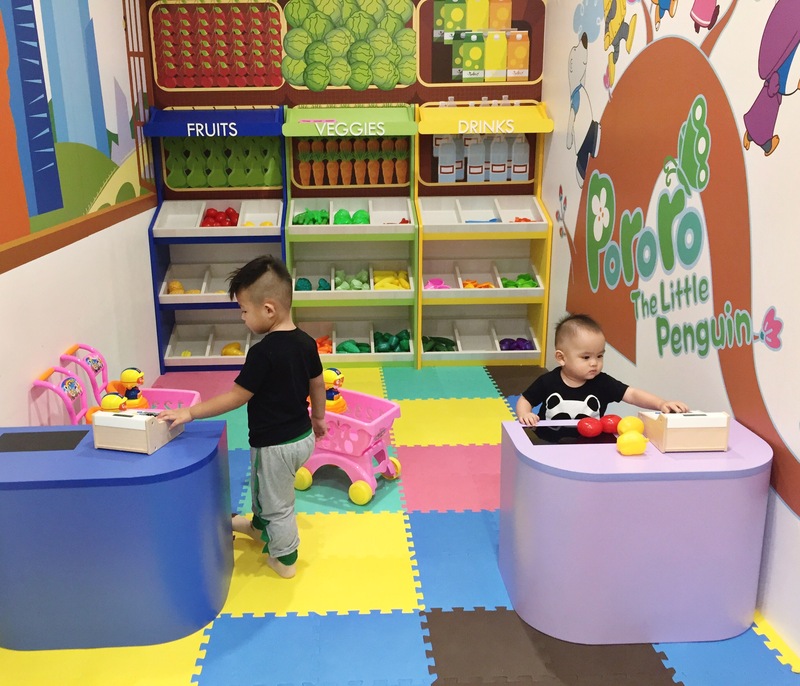 It’s small, and suitable for younger kids. 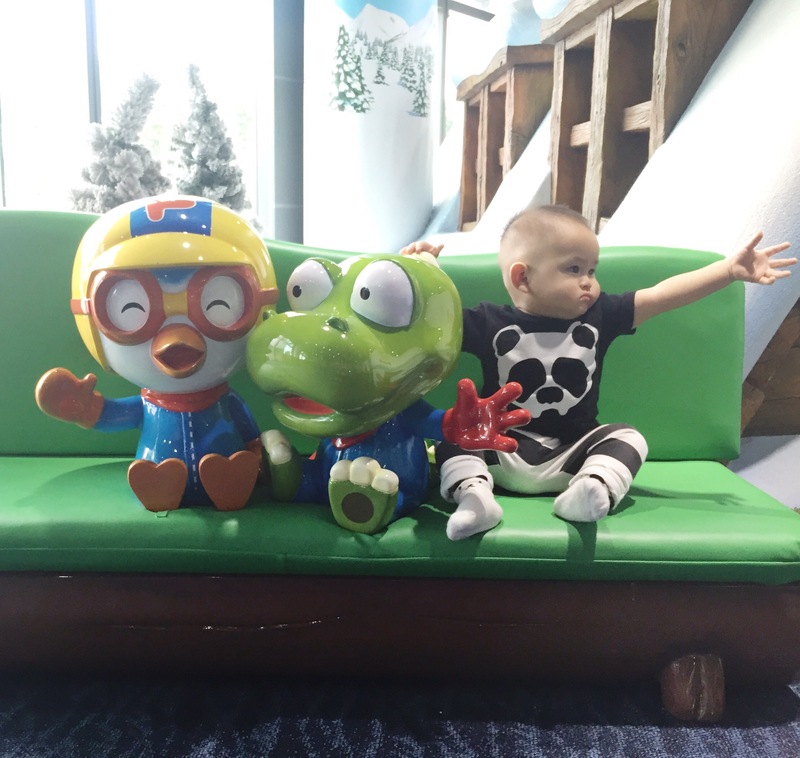 Jake is happy to crawl around and fiddle with the brightly colored props. 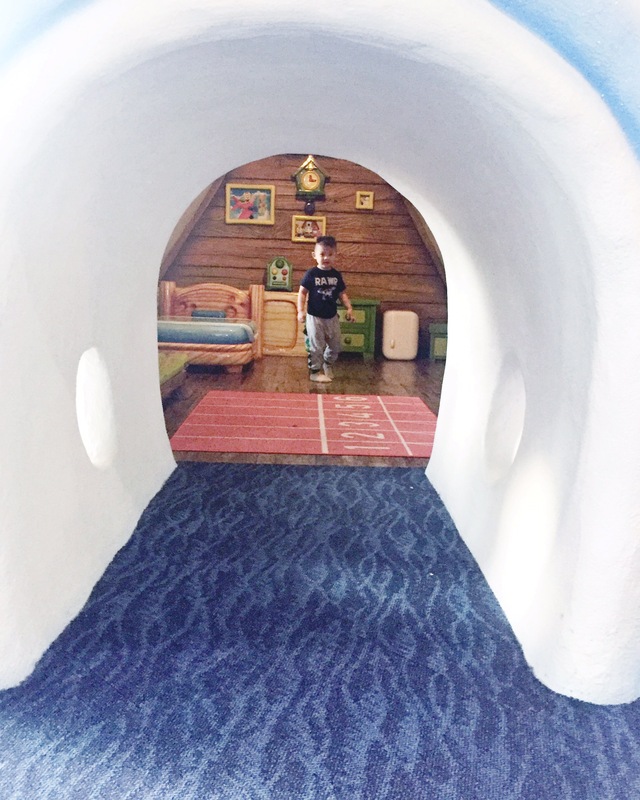 Next up, there is a toddler-friendly padded play course with a slide, a couple of observation pods and nooks for crawling and climbing. It’s not a very big play area, relative to play parks like Fidgets and Amazonia, but it’s adequate and very good for babies and under-twos. 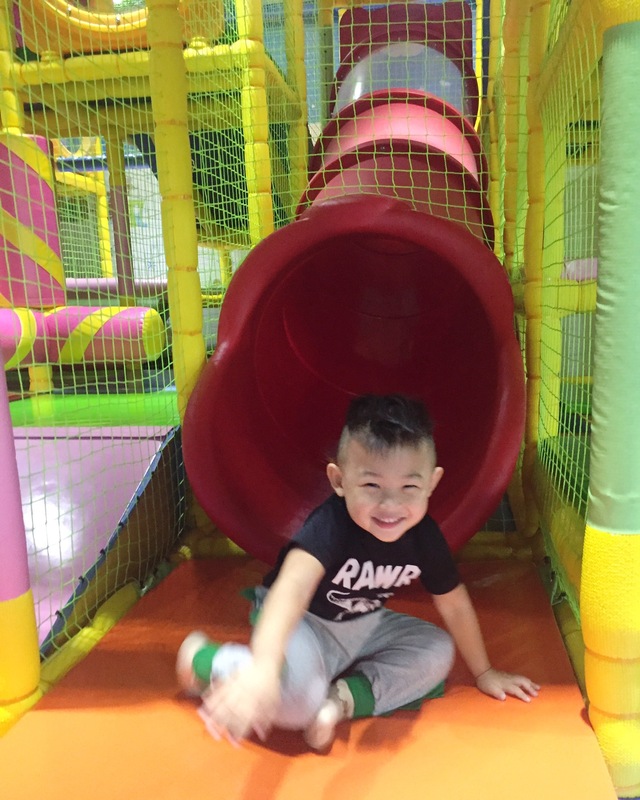 At three, Tyler was able to navigate with confidence around this course by himself, which of course is plus points from a parents’ point of view = less convoluted contortion, adult-accompanied crawling and climbing. The slide isn’t very big, but it’s a good size for kids two and below, and Tyler also really enjoyed it. 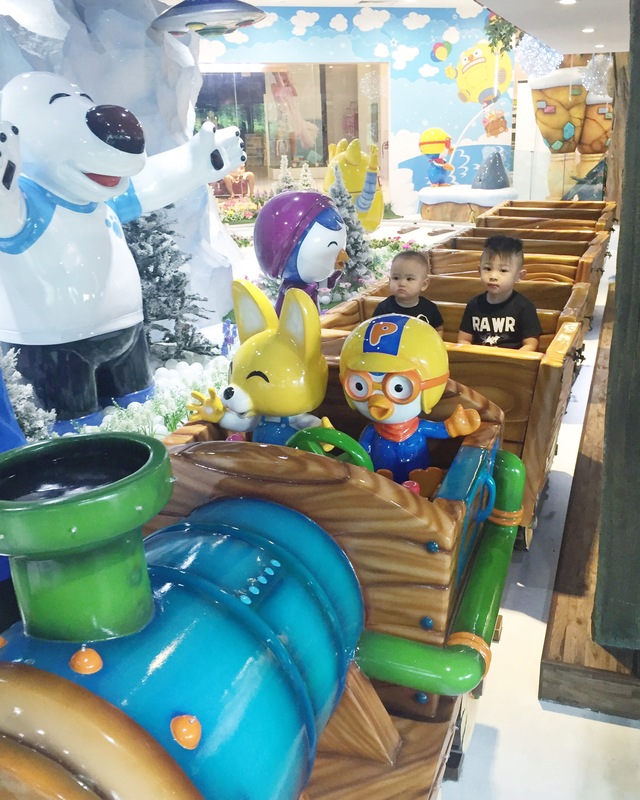 …in case you’re wondering where he’s sprinting towards – the highlight in Pororo Park, is this “life-sized” actual train which goes in a loop near the front window. It’s definitely the feature that draws many to the park. It runs on a schedule (every 60-90 minutes or so), so you don’t really have to worry about what time it runs as your visit should overlap with at least one train run. ﻿ Jake really REALLY loves the train, and he can ride it five times in a row without getting bored. He’s able to sit by himself , there’s a seat belt and and an attendant walks next to the train. (This was the main reason we signed up for the annual Silver membership- more on that later). 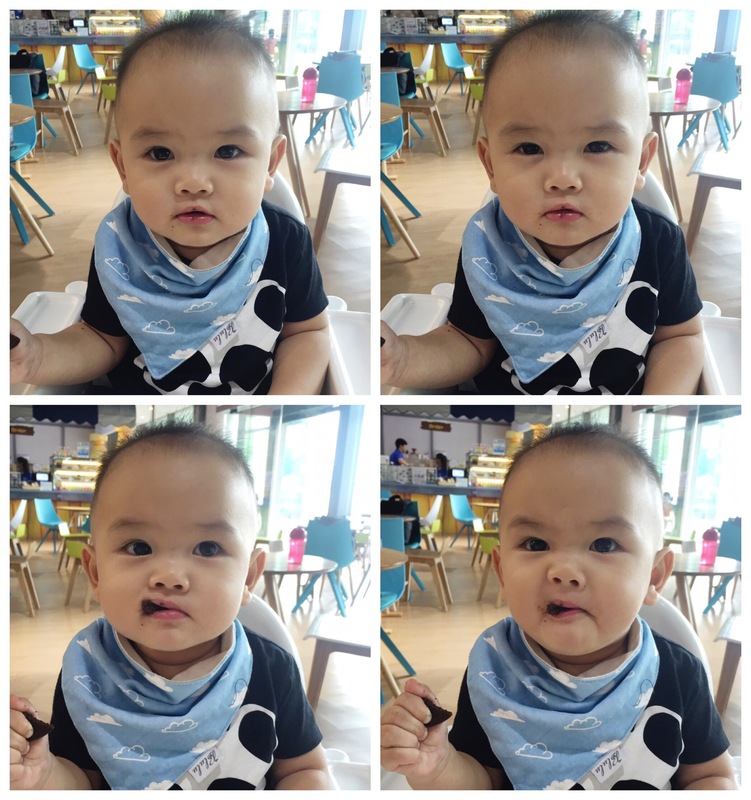 His face (below) when we tell him he has to out now! It’s also pretty cool that I’ve never seen a line for the train, even when the park is crowded, we are usually able to board without waiting for more than one train load. In fact, once most kids have ridden it once, they seem happy to move on to other activities, so while there’s a rush for the train when it first starts, it runs for half an hour each time and by the last few rides, most carriages are empty and Jake gets to go round and round without getting off as there’s no line at all. 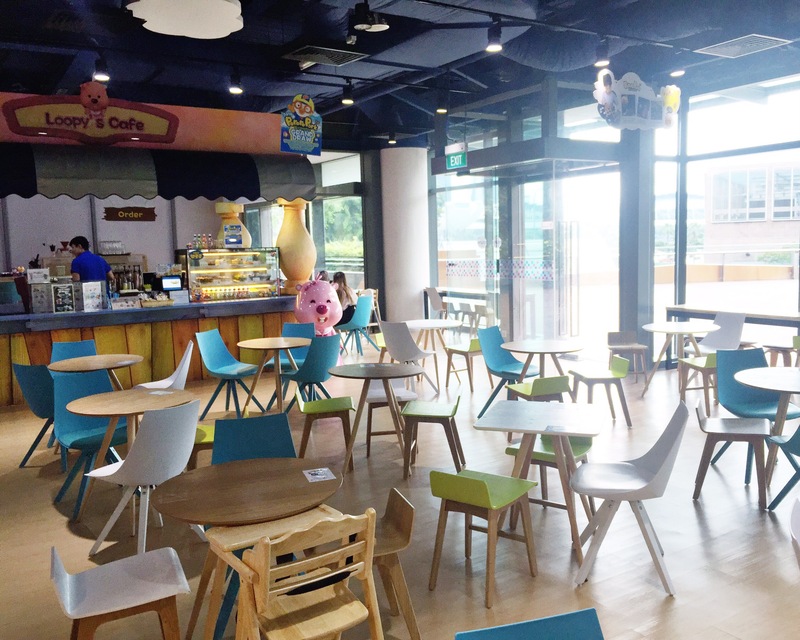 There’s a cafe in Pororo Park, where mums and minders can sit and hang out. The menu isn’t anything spectacular, but it’s bright and cheerful, a pleasant enough place to sit with a cup of coffee (and a laptop)! Jake seems to really enjoy the cookies! 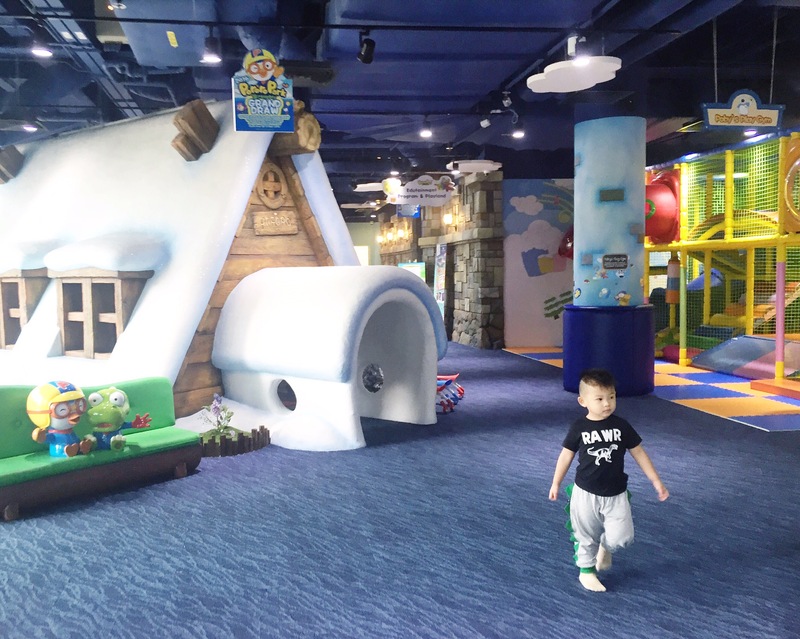 So Pororo Park is rather pricey, compared to other indoor play parks. 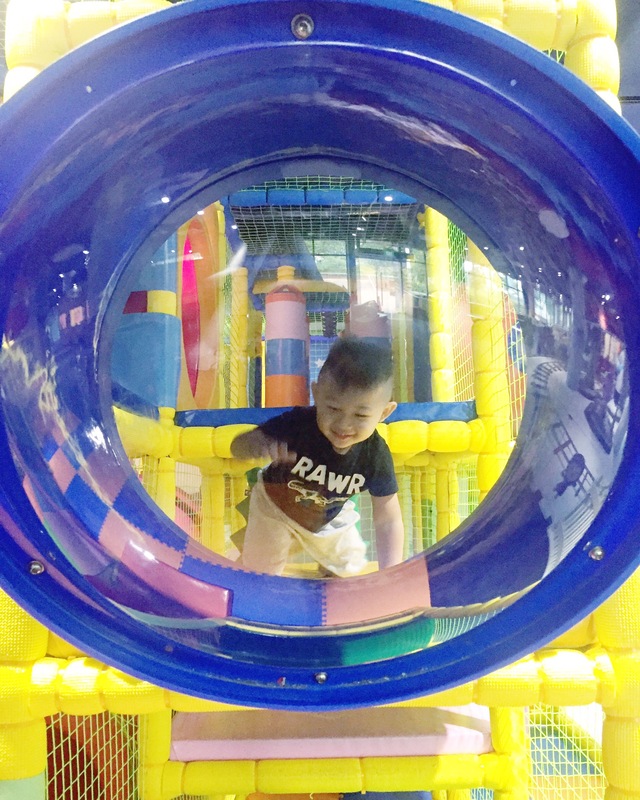 I suppose to answer whether it’s worth its steep entry price ($33 per entry + $6 per accompanying adult) – it depends on how old your kids are, and how much they love engaging with the space. 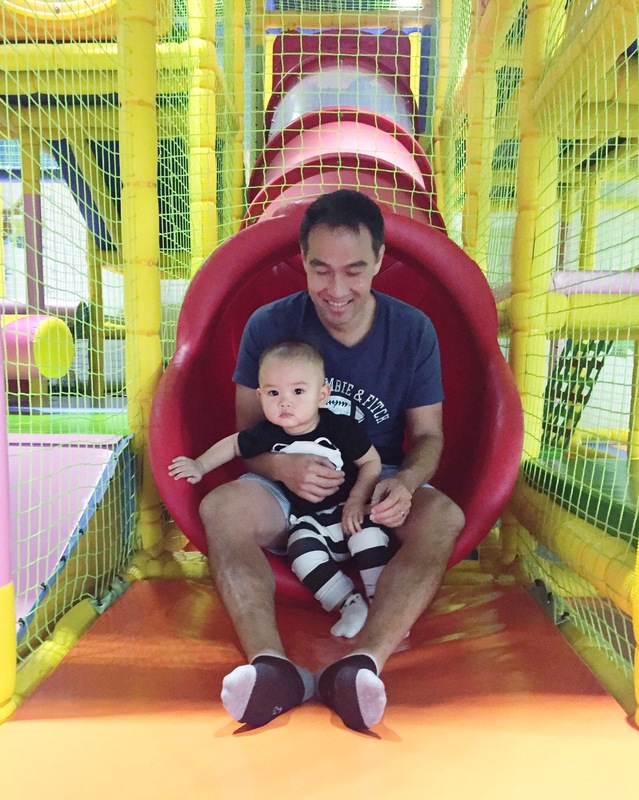 I’ve brought Jake to other indoor play spaces (average price $22-$25 per entry), but many were not catered to babies and toddlers. I also like the central, family-friendly Marina Square location. It’s not about how big the park is, but really whether the activities offered really interest your kids (eg that activity table with the cars looks like a waste of space especially compared to slides, ball parks and train rides – but that’s what my threenager loves MOST and was able to play there for over half an hour) – so my little ones really enjoyed Pororo Park and instead of shelving out $70 per visit (which is what it would cost approximately for 2 kids and accompanying adults), we decided to look at the membership packages. 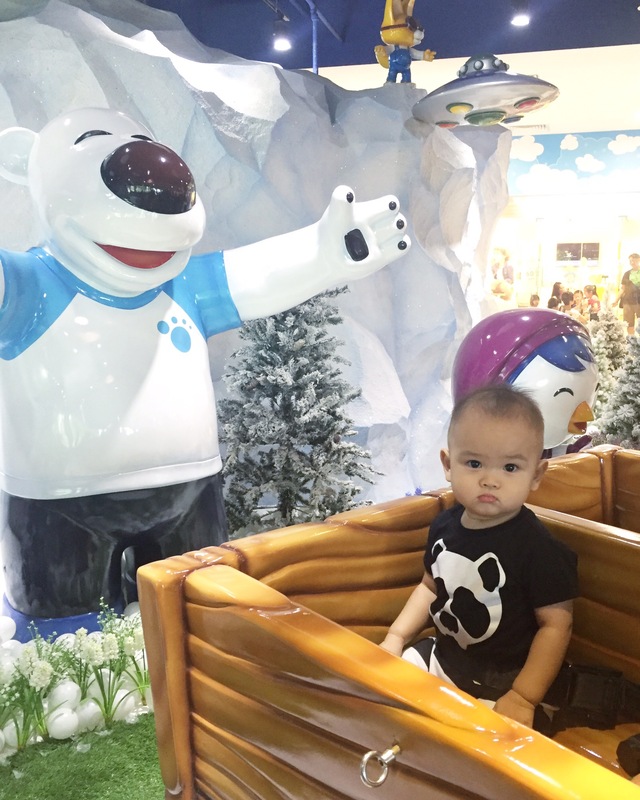 In the end, we opted for the $499 Silver membership (25 visits in 12 months, entry waived for two accompanying adults) – so that the grandmas and nannies can take the kids there too. It seems pricey upfront (way more than our Universal Studios Annual Express pass which is only $288!) 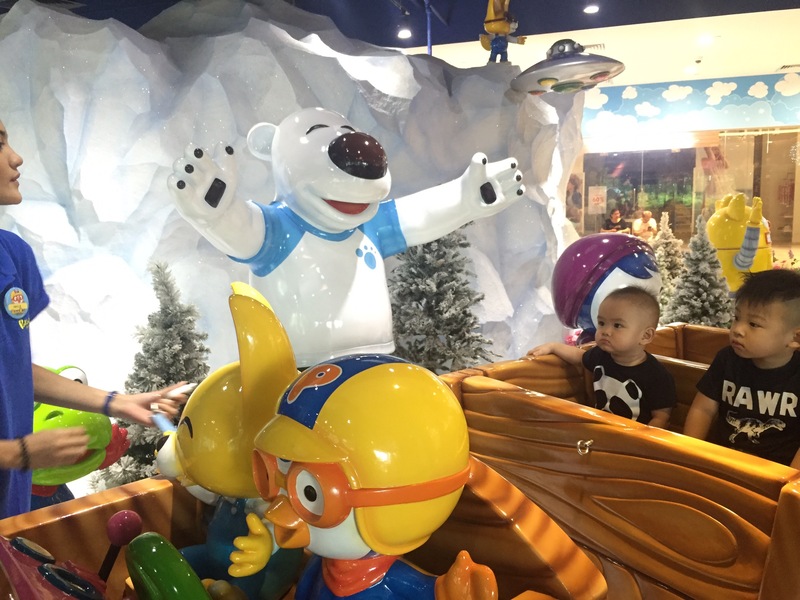 – but at the end of the day, to be practical – I have a toddler and a baby, and I’ll be using my Pororo Park membership way more than my Universal Studios annual pass… Did I mention indoors and air-conditioned … Enough said!